Sometimes, I sit and think. Sometimes, I just sit... That, of course, is a well-known North Country joke about an old-timer sitting on a porch. 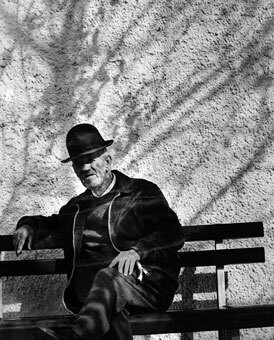 But it may just as well be this elderly man sitting on a bench in Nazarre, Portugal. I imagine he’s here most every day. This is HIS SPOT. And no one challenges him for it. When the sun is shining like it is this day, he probably takes three or four catnaps between entertaining friends who stop by as they circle the plaza on their afternoon stroll. It’s early spring, at least it seems that way to me based on the tree silhouette on the wall behind him. The branches seem to be carrying fresh blooms, barely sprouted; and the old man wears a woolen sweater under his coat. I get the feeling I’ve previously photographed this fellow in Paris and Amsterdam, and I’ve captured him on film half-asleep in Hartford, CT and Portland, Maine. Men snooze on benches.